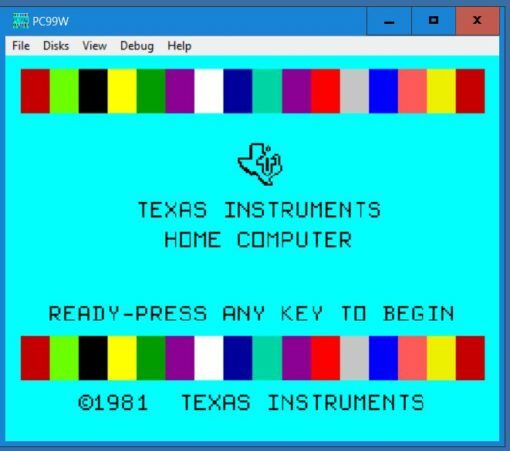 PC99W – A Windows program that emulates the Texas Instruments TI-99/4A Home Computer and selected TI and third-party peripherals. PC99W Config – A Windows program that lets you specify the components to be emulated by PC99W. PC99W Disk Utilities – A Windows program that lets you catalog and manipulate emulated TI diskette files. The Cyc – This contains all known TI modules and disks, and many, many other files. To Learn more click here. a99 Assembler – A freeware TI-99/4A cross-assembler. PC99 DOS – This is based on PC99 Stage 6 Full. For Windows 7 and higher this requires the freeware program DOSBox. PC99 DOS is supplied for “legacy” users. CaDD Launcher – A program that allows quick selection of CaDD PC99 Suite programs. Note: Not tested with Windows 2000, Windows Vista, or Windows 8 or 8.1. There is no theoretical reason why the CaDD PC99 Suite should not work on these operating systems. Intel Pentium 5 3.0 GHz or higher recommended. 4 GB Memory minimum recommended. 1280 x 1024 graphics or better. Hard drive with at least 1 GB space free. DVD-R or DVD-RW optical drive | USB 2.0 or higher port. Optional: COM port | USB->COM adapter, if transferring disks from TI to PC. A supported version of Microsoft Windows with DirectX. An “unzip” program such as 7-Zip or WinZip. A program that can read ASCII text files. Ex: Notepad, which is included with Windows. The ability to start and be able to use a command prompt on your PC. See the CaDD PC99 Suite overview and installation documentation here. Until the release of CaDD PC99 Suite, CaDD offered PC99 Stage 6 (Full or Light versions) and The Cyc separately. Because of licensing arrangements with Texas Instruments and third-party vendors, you had to be an owner of PC99 Stage 6 (Full or Light versions) to order The Cyc. By bundling PC99 DOS, the PC99W emulator, and The Cyc in CaDD PC99 Suite, this restriction no longer applies. Due to the digital nature of this product all sales are final and we offer no returns. If you have any questions or concerns please contact us before making your purchase.